Santa Cruz Media, Inc. is the owner of all of Fr. John Corapi’s intellectual property and the DVDs, CDs, and books that flow from it. We are a secular corporation and not affiliated with the Catholic Church in any way. As such, we are not under the jurisdiction of any bishop or other official in the Catholic Church, although we have the utmost respect for Church authority. We fully support Rev. John Corapi in this terrible trial, not surprisingly having begun on Ash Wednesday. Through the sacrifice and struggle of the desert and all of the dark moments that this entails, we are confident that the glory of the risen Lord will shine forth from the power of the Resurrection and Easter. We have consulted with a number of canon lawyers. They have assured us that the actions of the Bishop of Corpus Christi, Texas are, on several points of canon law, illicit. It is our fervent hope that The Dallas Charter will be changed because of false accusations like this. There is no evidence at this time that Fr. Corapi did anything wrong, only the unsubstantiated rant of a former employee, who, after losing her job with this office, physically assaulted me and another employee and promised to “destroy” Father Corapi. We all continue to pray for this person, and we ask you to do the same. We sincerely believe that the work Fr. Corapi has done is of greatest value to the Church, hence hated by the devil. We fully intend to make Fr. Corapi’s material available as a service to the Church and the world for as long as we possibly can. The Church provides no financial support to Fr. Corapi. He has to pay for his own legal representation, medical costs, food, housing, etc. We have never accepted donations or charitable contributions of any kind. We are supporting Father’s efforts to defend himself. Your purchase of products from Santa Cruz Media helps provide the funding for Father’s continued work as well as the legal expenses he continues to incur as a result of these malicious allegations. Father Corapi and all of us here at Santa Cruz Media, Inc. greatly appreciate your kindness, support, and prayers. Please continue to pray for Father Corapi and his accuser, as well as all priests who find themselves in this unfortunate situation. The CEO of Santa Cruz Media is none other than John Corapi. Tributes paid to a special and dedicated Christian person. A Scots Christian campaigner from Scotland who worked in the Third World has been killed in a bomb blast in Jerusalem. Mary Gardner, 59, who previously taught in Orkney, was the only fatality. She was caught up in the explosion caused by a bomb placed in a phone booth as she stood at a bus station in the Israeli city. She died in hospital from her injuries despite desperate efforts by paramedics following Wednesday’s terror attack. Ms Gardner, who was studying Hebrew at the city’s Hebrew University, was employed by the Wycliffe Society, which works to provide translations of the Bible to the estimated 340 million people who can’t read it in their own language. Mary’s parents Jean, 81, and Tony, 82, who live in the Aberdeenshire village of Old Rayne, paid tribute to their eldest child. Mr Gardner said: “We are all devastated by the sudden loss of our daughter in this tragic and unexpected way. “Mary was a very special person and we thought the world of her. She was devoted to her work and was well liked wherever she went. “She was in Israel for six months studying Hebrew in order to go back to Togo to translate the Old Testament. Mary was an extremely popular and competent colleague and we valued her very highly. She will be sorely missed. The Israel Ministry of Foreign Affairs said Ms Gardner was killed by the blast across the street from the Jerusalem Convention Centre near the central bus station. 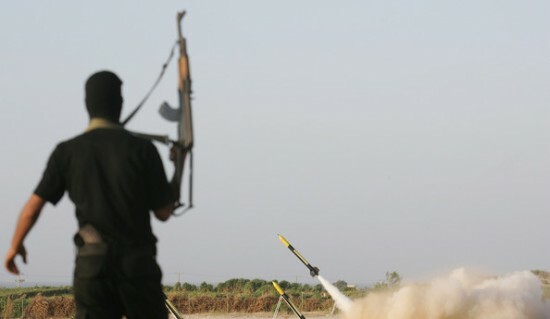 Jerusalem – Palestinian militants in Gaza fired a new wave of rockets that landed deep inside Israel Thursday, defying Israeli retaliatory attacks and threats. As the violence threatened to escalate the day after a deadly Jerusalem bombing, Israel got a boost from the visiting U.S. defense chief, who said no country could tolerate the “repugnant” attacks on its soil. Police said Gaza militants fired 10 rockets and mortars toward Israel Thursday, including two rockets that exploded north of the city of Ashdod, a main Mediterranean port city about 20 miles (30 kilometers) north of Gaza — a first since Israel and Gaza’s Hamas rulers reached an unofficial truce following a three-week war that ended in January 2009. Israeli airstrikes hit a number of Gaza targets in retaliation throughout the day. Neither side reported injuries or said they wanted a new fight. But the new hostilities could easily spin out of control, especially if civilian deaths mount. These people warmongers simply will not rest until Israel is wiped off the map! The Feast of the Annunciation, March 25, is one of the most important in the Church calendar. It celebrates the actual Incarnation of Our Savior the Word made flesh in the womb of His mother, Mary. The biblical account of the Annunciation is in the first chapter of the Gospel of Saint Luke, 26-56. Saint Luke describes the annunciation given by the angel Gabriel to Mary that she was to become the mother of the Incarnation of God. This “angelic salutation” is the origin of the “Hail Mary” prayer of the Rosary and the Angelus (the second part of the prayer comes from the words of salutation of Elizabeth to Mary at the Visitation). The Angelus, a devotion that daily commemmorates the Annunciation, consists of three Hail Marys separated by short versicles. It is said three times a day — morning, noon and evening — traditionally at the sound of a bell. The Angelus derives its name from the first word of the versicles, Angelus Domini nuntiavit Mariae (The Angel of the Lord declared unto Mary). Mary’s exultant hymn, the Magnificat, found in Luke 1:46-55, has been part of the Church’s Liturgy of the Hours, at Vespers (evening prayer), and has been repeated nightly in churches, convents and monasteries for more than a thousand years. Your word became man and was born of the Virgin Mary. Wikipedia has more on the Annunciation here.